MythMusic is a sophisticated MythTV plugin that allows you to play and manage music and audio files .i.e MP3, Ogg, FLAC, wav etc. It is specifically designed to be operated by a normal remote control. The best approach is to follow the installation guides for MythTV and MythMusic that have been developed for your Operating System and distribution. If you are still having problems getting MythMusic to work, see this section on MythMusic Installation. For global MythMusic configuration. Go to the Utilities/Setup->Setup->Media Settings->Music Settings->General Settings. In particular you can set up which directory your music is stored in here. Before you start to import a CD into MythMusic there are a few things you should check. Insert the CD before selecting "Import CD". After a few seconds MythTV will query the Internet freedb database for your CD information and the Import CD screen will show, with the Artist, Album and tracks information. You can make changes to any of the items on the screen at this point before you finally select the "import this CD" button. You now see the progress screen showing each track as it is ripped and transcoded, as well as the overall progress on the whole album. Once import has finished you can configure your CD to be ejected. If you have files that have been ripped to Apples aac format this should be no problem. Either copy these files into the MythMusic directory and then scan for new music, or mount your collection onto the systems file system and point your MythMusic directory to it as above. MythMusic is able to detect album art in mp3 files, stored as picture files within ID3V2.3 or ID3V2.4 tags (verified on MythTV 0.21). Since Myth boxes are usually connected to nice large screens, album cover art is definitely a plus! As of MythTV 0.21, album art can be in jpeg or PNG format (other formats not tested), embedded in ID3v2 (2.3 or 2.4) as type "Other" in the pictures tag: avoid "leaflet" or "cover" as MythMusic won't display the cover art in that case. Album Art is only supported in MP3 files, not MP4 yet. You don't have to create a Playlist just to play an album or song. With the "show entire music tree" configured, you will see your Playlists to the left of the Play pane as per the picture above. More importantly you will also see a default Playlist called "All My Music". Once you select this Playlist you will see all your music organized alphabetically by Artist. Use the Left and right arrow keys to switch between the Playlist pane and the Play pane. Use the up and down arrows to select your Playlist and the the right arrow key to select the Artist then right arrow again to select the Album then right arrow again to select Song etc. Press select to play at any point either the Artist, Album, or Song. Press the left arrow button to backtrack. When you first start using MythMusic you will find two entries in the Playlist pane already defined. All My Music -Exactly that, use this to directly access any Artist, Album, Track from the Play pane. This is a temporary playlist that you can add and remove entire Albums or individual tracks to create a Playlist. Once this has your songs you want you can then save it to a named play list. Of course you can play the Active Play Queue just like any other playlist. To add songs to the Active play Queue you need to enter the playlist management screen by pressing 3 from the "Play" screen or by selecting the "Select Music" option from the Music Tools menu. 1. All My Music -Add files from your collection to the Active Play Queue. 2. The album you have in your CD drive -Select songs to play. 3. All your play lists previously defined (initially empty)- Select which playlists to perform actions on. 4. Your Active Play Queue -Select what actions to perform on your Active Play Queue. 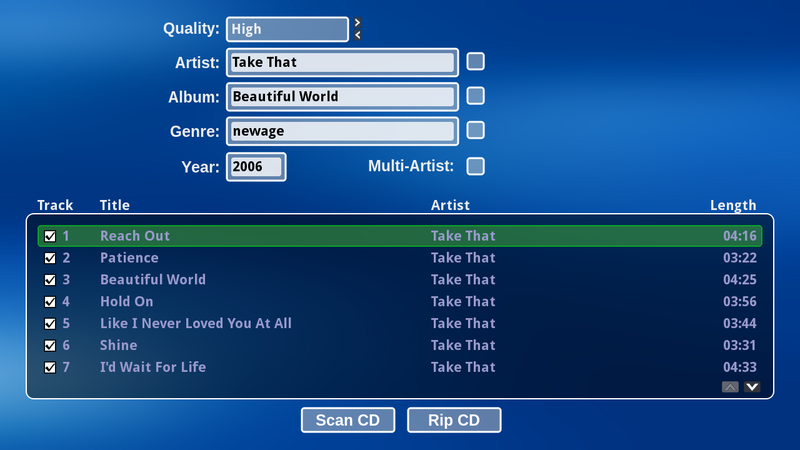 From the the Playlist management screen you can browse the entire collection from "All My Music". 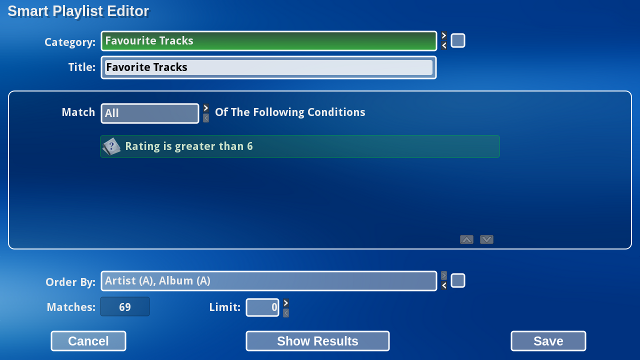 Add tracks to the current queue by pressing 'Select' to toggle the checkbox next to its name. Entire Albums, Genres or Artists may be added in one go. If you don't have all the items in a sub menu selected this will be indicated by the checkbox being colored Grey rather than White. 1. In the Playlist management screen, highlight Active Play Queue. 2. Press OK. A popup menu will appear (see Create a Playlist, below). 3. Highlight "Clear the Active Play Queue" and press OK.
From the playlist management screen, browse existing playlists from "All My Playlists". Highlight the playlist in the selection tree and hit the I/Menu key then select "Delete this Playlist" from the popup. Once you have defined the criteria, you can select the "show results" button to get a sample of the tracks that would form the playlist. FIXME: how can I get these smart playlists to show up in the "All My Playlists" screen? There are currently a number of visualizations for MythMusic that will be displayed in a small window while the Play window is visible, but will be displayed full-screen when you change the visualization mode with by pressing on your remote. Press the to cycle through the available visualizations. Which of these visualizations are to be used can be specified as a space-separated list in the Setup menu for MythMusic. AlbumArt This displays the album art for the currently playing music. Basically, any image in the same directory as the music file currently playing is treated as if it might be album art, and one is selected randomly for display. Gears It's the GLXgears demo. As with all MythTV development work, modifications are worked on as "tickets" on the MythTV Trac Server. To have a look at the latest developments on the active tickets for the MythMusic module, scroll down to the MythMusic section of the Active Tickets by Component page.